Yesterday I spent the entire day at the barn helping with a dressage show. I can point you to pictures, but I don't think I can imbed them here. We had a nearly random test, with a large puddle in one corner providing amusement value for the judge, some appalling moments and some sublime ones. Another set of cards. 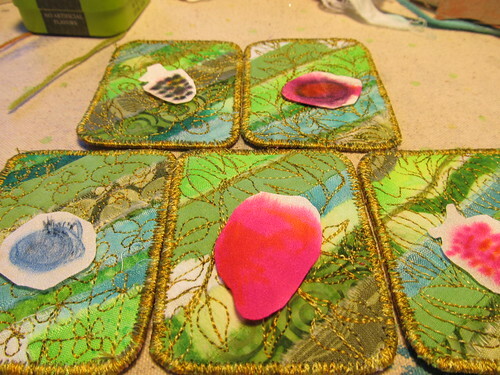 These are almost large enough to be coasters, if one was so inclined. Since they are going in a thing that used to have berry tea, I thougth I'd put some mixed berries on them. With additional stitching, they should round out some… Dyed silk really shines!